Just like ASMR clips and makeup tutorials, pimple-popping videos have become some of YouTube’s most popular niche offerings. And, as fans of these clips know, one name reigns supreme in this gross out world: Dr. Sandra Lee, better known to some as YouTube’s Doctor Pimple Popper. 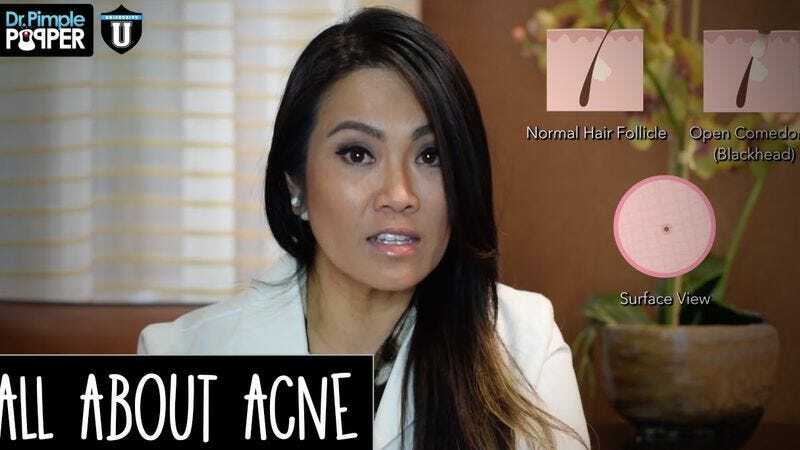 A Southern California dermatologist with a soothing voice and easy access to an iPhone camera, Lee has made dozens upon dozens of videos of her practice’s clients getting blackheads removed, cysts excised, or whiteheads squished. Some of her clips, like one of regular client “Mr. Wilson” (not his real name), have even garnered millions of views, prompting thousands of YouTube comments by people who just can’t seem to look away. One of the first films she posted to YouTube was of an octogenarian man with a swollen, misshapen nose (the result of a condition called rhinophyma). As Lee was inspecting him, she noted that his nose practically bristled with blackheads. She made him a proposition. If he allowed her to squeeze the blackheads from his nose and film it, she would perform the procedure for free. He agreed. To protect his anonymity, she referred to him only as “Mr. Wilson,” after his resemblance to Walter Matthau’s character in the film Dennis The Menace. That video—the first installment of what would become a series—shows her careful hands pressing a tiny metal loop, called an extractor, into the surface of the man’s nose. With each stroke of the extractor, a long tendril of whitish-gray sebum would burst forth. Sometimes multiple strings would appear simultaneously, like Parmesan cheese run through a rasp. “So gross but I can’t look away,” remarked one commenter. “I thought I was the only one who liked watching this!” wrote another. The video has since been viewed nearly 7 million times. According to the piece, Lee’s YouTube channel has over 850,000 subscribers and could earn the good doctor hundreds of thousands of dollars this year, even though extractions—what doctors call pimple popping—are still only a small part of her actual dermatological practice. The whole article—complete with descriptions of “pungent cheese” smells and what it’s like to cut a fatty tumor out of someone’s forehead—is over at The Cut.